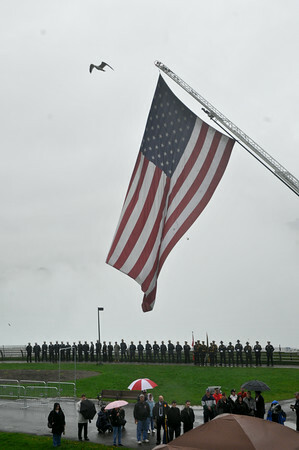 James Neiss/staff photographerNiagara Falls, NY - Members of the Niagara Falls Fire Department, U.S. Army, NYS Parks Police, Niagara County Sheriffs and Niagara Falls Ontario Police Honor Guard stand at attention at the raising of The Patriot Flag on Goat Island. The flag is on a national tour that began on Sept. 10, 2010 and ends August 2011. The Patriot Flag - 30 x 55 feet - is being flown from atop a Niagara Falls Fire Department ladder truck for approximately 55 minutes. Fifty-five minutes was the elapsed time between the collapse of the first tower and the second tower on September 11, 2001.